Cord loops on bronze vases are known from as early as the Han dynasty and there were certainly such vessels in the Imperial collections, providing a possible source of inspiration for this form; even the shape itself could have been taken from a Han bronze. Another possible source is the Japanese inro. We know that the inro was introduced into Beijing palace arts during the Yongzheng period. For a discussion of two Yongzheng jade bottles based on the inro form and two known palace enamel copies of inro bearing Yongzheng Imperial reign-marks, see Moss, Graham, and Tsang 1993, p. 85. This may have been the source of a group of Qianlong snuff bottles of flattened forms with various methods of stringing them on suspension cords at the narrow sides (see Friedman 1990, no. 69). Apart from the form, several features allow an attribution to the palace workshops. 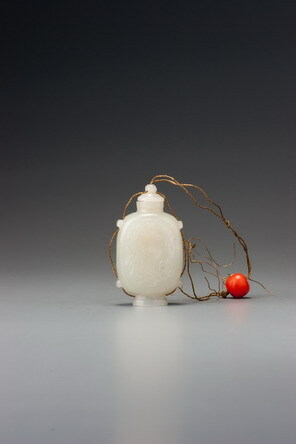 The distinctive hollowing, which is well hollowed in the upper section of the bottle, but leaves a heavy base area, is typical of the Beijing palace workshops of the Qianlong era, as is the type of stopper and the integral nephrite ‘cork’. The flat upper neck rim is also a standard palace feature, and the eccentric form with the deeply recessed foot are all associated with the court. What is intriguing here, however, is that the style of carving is inspired by the seventeenth- and early eighteenth-century ‘first phase’ style of Suzhou carving, which is based on the works of the famous late-Ming artist Lu Zigang, whose name appears on this example. The way the style is interpreted, however, is quite unlike Suzhou workmanship from the early to mid-eighteenth century. The relief inscription is also less fluent than was common at Suzhou at the time, and a further telling point is the colour of the nephrite. Suzhou tended to favour a much whiter colour of nephrite for works of this kind, whereas the court used a great deal of this pale greenish-white colour. It is more likely that this bottle is a court product but copying the style of Suzhou, which was renowned throughout the empire by that time. This might have been more likely to happen during the first half of the century rather than during the later Qianlong reign when the emperor’s distaste for certain elements of Suzhou style was established. For a miniature bottle, it has extraordinary presence partly due to the unusual form and the quality of carving. Like the finest of miniatures in any field, it looks like a work that was made full size, without any of the constraints of its true size, and then somehow shrunk to its present dimensions. It also employs an extremely rare textural feature in the carving. The surface relief is all polished to a higher sheen than the ground plane, which is matt. This is an unusual technique and one often used on seventeenth- and early eighteenth-century plaques carved at Suzhou, just to inject a necessary cautionary note into our attribution to the palace workshops. There is a bit of scholarly wit in the carving: the characters on one side of the bottle are the second line in a couplet from a familiar poem by Wang Wei. The first line of that couplet, “The bright moon shines among the pines,” is present on the other side of the bottle in the picture of a scholar beneath a pine tree.